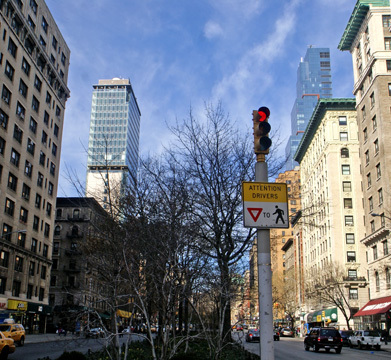 Ariel East is one of two tall residential condominium towers erected in 2007 by the Extell Development Company across from one another on Broadway between 99th and 100th Streets. Ariel East is 37 stories and has 64 apartments and was designed by Cetra/Ruddy. It has 7 setbacks facing Broadway and is distinguished by its reflective-glass façade with red piping accents. Ariel West is a 31-story tower with 73 apartments at 2633 Broadway and it was designed by Cook & Fox. It has a few setbacks and a slab form. It is a mid-block site that was formerly occupied by a Gristedes store that collapsed during demolition injuring several pedestrians. Extell names many of its projects after stars. 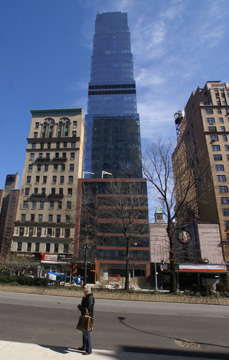 The two towers, which were completed in 2007, have significantly altered the northern skyline of the Upper West Side that heretofore has been dominated by the Riverside Church at 120th Street and Riverside Drive, the Master Apartments on Riverside Drive at 103rd Street and the Columbia Apartments at 275 West 96th Street. 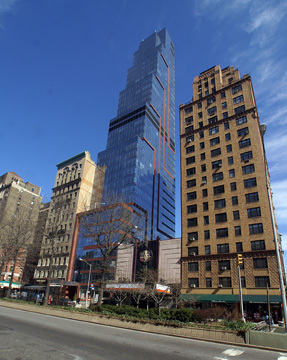 For the Ariel East tower, Extell purchased development rights from St. Michaels Church on Amsterdam Avenue. Ariel East is adjacent to the Art Deco-style Metro Theater. The project involved the acquisition of about 70,000 square feet of air rights from St. Michael's Episcopal Church at 225 West 99th Street. Ariel East had an initial offering price of $152,055,000 and a one-bedroom, one-library, two bath apartment on the second floor with a total of 1,551 square feet is priced at $1,375,000. A four-bedroom, three-and-a-half bath apartment on the 28th floor with 2,726 square feet was priced at $3,595,000 and a four-bedroom, 3-bath penthouse with 4,130 square feet of interior space and 88 square feet of exterior space was priced at $6,750,000. Residents at Ariel East have a private theater, swimming pool, billiards lounge, La Palestra fitness center, garden, and children's playroom. There is also a pet spa. The building has no balconies but terraces on the 8th, 16th, 21st, 27th, 33rd and 36th floors. The building is about 398 feet tall. The third floor of the former building at 2628 housed the Manhattan Table Tennis club. 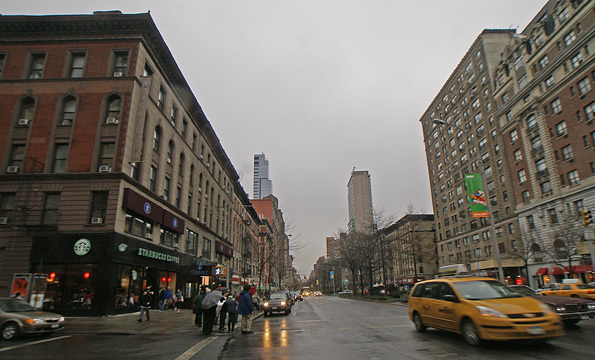 The two Extell towers created considerable controversy and led to a rezoning of 51 blocks between 96th and 110th Streets where building heights were limited to 145 feet on Broadway and the transfer of air rights from side-streets was forbidden. A March 5, 2006 article by William Newman in The New York Times said that Extell bought 19,148 square feet of development rights for Ariel West in April, 2006 from the owners of four townhouses on 99th Street west of Broadway. The article said that "the owners' lawyer, Gary R. Tarnoff, said he was able to get Extell to agree to several concessions that benefited his clients, including an agreement that the developer would try to place a garage entrance away from their property," adding that they were paid a total of $2.72 million. The price paid by Extell per square foot of development rights ranged from $132 to $148 and two of the townhouse owners retained 500 square feet of air rights for possible later additions to their houses. 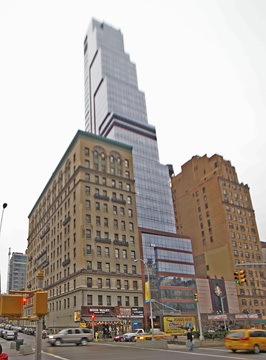 Extell has also developed the Orion at 350 West 42nd Street and the former Stanhope Hotel at 985 Fifth Avenue and Altair 18 and Altair 20, condo conversions in Chelsea at 32 West 18th Street and 15 West 20th Street, respectively. Gary Barnett, a principal of Extell, was a principal in the recent purchase of a large property at the southern end of Riverside South, the huge development by Donald Trump.